This study guide is put out by the maker's of the ACT itself, so you'll receive plenty of insider tips if you study with this book by your side. 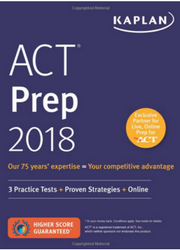 The Real ACT Prep Guide contains three practice tests (previous edition had 5 tests). It provides information on how to register ACT test and also features content and procedures that you'll need to follow on test day. An in-depth review of the optional Writing Test will prepare you for the writing portion and how it is scored, plus the examples of all the question types and strategies for answering each type will ensure you have everything you need to be successful. Some additional features unrelated to the ACT included in this book are college guides and information about tuition payment plans. The 2018 edition has additional 400 questions available online. Barron's ACT 36 receives rave reviews for its English section which reviewers claimed provided just the right challenge to help them score high on the exam. This text put out by the test-prep giant, Barron's, aims to get students a 36 on the exam, a perfect score but claims that this lofty goal is something all students should aspire to achieve. This innovative book comes complete with advice and strategies for dealing with some of the difficult questions, extra-challenging practice tests for each of the test areas, and instructions on how to read efficiently and with high retention rates. This edition also has a few unique tips on how to boost your science score. Finally, the section on how to write a winning essay will help you to nail this portion of the test. Princeton Review's Cracking the ACT is another reliable study guide to have on hand when you are preparing for the ACT. Reviewers and test-takers claim they like the strategies offered in this study guide and they find the text to be a strong, comprehensive review, but they do warn you to watch out for typos. This book comes with access to three practice tests, all with detailed answer explanations. A review of all the content covered in each of the five sections also makes this a strong study guide. A step-by-step guide on how to write an excellent essay is found in this text and well as strategies for tackling complex algebraic problems. Every chapter comes filled with practice questions and explanations. Finally, lessons and tutorials are available online with the purchase of this book to ensure you are fully prepared for the test day. If all you're looking for is practice, practice, and more practice, then this is the book for you. One reviewer claimed 1,460 ACT Practice Questions by Princeton Review comes the closest of all the study guides to creating questions that are like the real thing. With the theory that practice makes perfect, this guide includes three full-length practice exams, hundreds of practice questions broken down by subject area, and detailed answers for all the thousands of questions you'll find. You might want to buy an additional guide for studying and test-taking strategies or general review, but you won't go wrong buying this guide purely for the practice potential. Kaplan is a popular brand and it's quite popular for Exam prep. books. It includes 12 video lessons from Kaplan instructors and online content to practice. It's a massive book with 900+ pages and includes practice tests (two tests are online and one is included in the book). All tests come with detailed explanation of answers. The book has a section in beginning which explains the structure of ACT Exam in detail. The book costs $15 and is highly recommended. You can get it from amazon or Barnes and Nobles. The book has 2-3 Units for each section: English, Maths, Reading, Science.